The last few weeks I have struggled to create a dish that screams Persian. 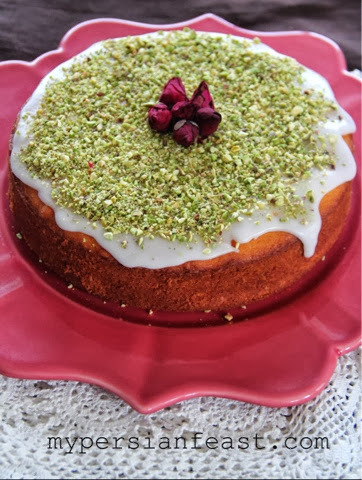 Even though, all my life I have been surrounded with Persian food, it is still difficult to create recipes that speak of all things Persian to the rest of the world. Creating elegance, delicacy, fragrance and balanced subtle flavours on one plate is an enormous task. 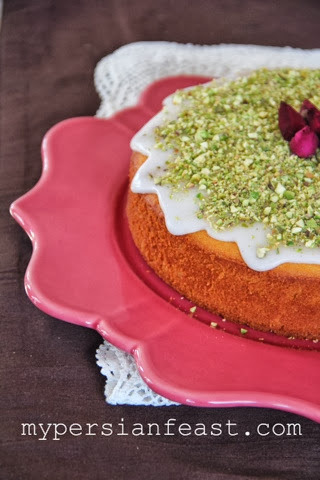 I have been on a hunt for a simple cake recipe that translates Persian cuisine. 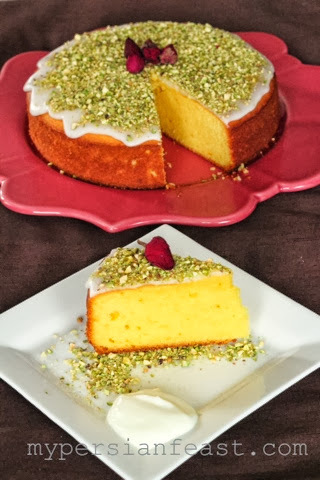 Persians bake a dense muffin (cake Yazdi) but these days it is considered no more than a simple muffin. Yoghurt in the Middle East is a vital ingredient in cooking and baking, so important that it is even used in pastries like Ghotaab. I can never forget the yoghurt cake mum used to make on cold winter days. It was a simple yoghurt cake, as plain as cake can really get but it was the anticipation of knowing there was cake after school. Baking cakes is not mum's forte yet she can bake perfect loaves of bread. I still remember the day she watched a good neighbour bake a cake so she could learn how to bake. Taher (short for Tahereh) carefully measured the sugar and oil with tablespoons. To be exact 7 tablespoons of each and soon it became famous as the 7-tablespoon cake! It was mum's first cake she proudly baked and remained her last successful cake! Occasionally mum bakes cakes but every time she bakes something drastically goes wrong and her last words are "my daughters bake so perfectly, no need for me to perfect my baking skills". The other day I was in the mood to bake and decorate a cake and knowing that we haven't had cake in a long time I settled to make our household's standard cake. Being Persian does really mean that our kitchen is stocked with saffron, rosewater, walnuts, feta and pistachios most of the time. It has been long since I used any of these in baking so I thought let's give it a go and let others judge the cake. The cake was a treat and saffron was the star! 1: Beat caster sugar and eggs for 5 minutes or until leaves a trail. 2: Add oil, yoghurt and saffron. Beat for few seconds to mix. 3: Sieve flour and baking powder over the cake batter slowly and fold in with a spatula. 4: Bake at 160C for 45 minutes (or until slightly springy to touch). 5: Cool in the tin. 6: To make the icing: mix icing sugar with 1 tablespoon of water at a time until the mix is thick and not too runny. 7: Sprinkle with chopped pistachios.